Cut to size and adhere with Sound Stick Adhesive on almost any surface. Available in your choice of Convoluted, Aluminized Mylar Facing or Standard Open-Celled. FOB Shipping Point. Convoluted Acoustical Foam...features peaks and valleys which redirect sound waves into the foam where the sound is converted to kinetic energy and absorbed. 4 sheets per box in 2" or 3" thick NRC rating 2" .86", 3" .91. Aluminized Mylar Facing Foam 1" Thick...ideal for use in dirty environments. 1 mil aluminized facing laminated to one side reflects light, heat and resists dirt, grease and liquids. Easy to wipe clean. Rolls are 54"W. x 1" thick. NRC .70. 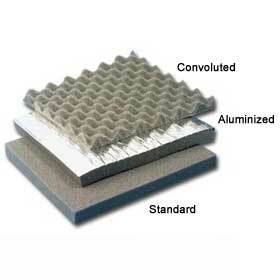 Standard Open-Cell Foam... open-celled polyurethane foam has good structural integrity. Particularly effective absorber of mid-to-high frequency noise. Rolls measure 54"W. x 1" thick. NRC .85.